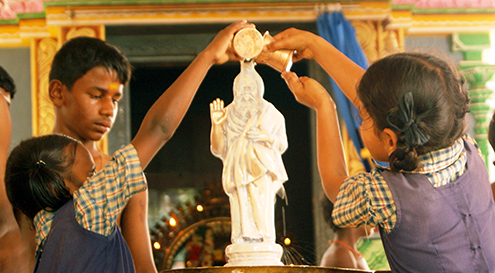 Categories: Religious festivals, Spiritual Discourses. On the full moon day in May we celebrate the birth, enlightenment and samadhi of Lord Buddha. The prince Gautama who became the Buddha gave up all his unimaginable privilege, wealth and worldly power to dedicate himself totally to the spiritual path. He meditated with immense sincerity and concentration during seven years; at the end of this intense sadhana he gained enlightenment. He then left the forest and started to teach others how to develop themselves spiritually and reach the same, blissful stage that he had attained. 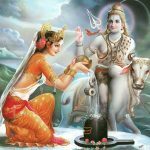 Mahadeva (the Great God), Paramatma (the one unbounded universal Self), pure bliss, pure love, the first yogi, the first guru, That which is not – Shiva is all of these, and ‘The Great Night of Shiva’, Mahashivaratri, is one of the most important spiritual observances in Hinduism, a celebration which occurs once a year on the 14th day of the Hindu month of Magha (in February-March), just before the new moon. Why on this date and why is it so significant? At this exact time the planetary influences or forces of nature are such that they offer us the opportunity to make the very best use of our natural energies to merge with the Divine, with Shiva, and to receive his grace. 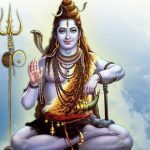 The scriptures, and indeed Swamiji, encourage devotees to observe Mahashivaratri by fasting and staying awake all night while keeping our thoughts continuously on Lord Shiva, and engaging ourselves in various spiritual practices. In the Ashram those practices include meditation, abhishekams, chanting ‘Om Namah Shivaya’, singing devotional songs, as well as taking part in or watching devotional dramas, dance and musical performances. 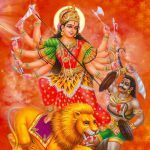 In Sanskrit nava means nine and ratri means night (just as we have Shivaratri – the night of Shiva) and so, according to tradition, during this festival consecrated to the Divine Mother, we perform abhishekams to worship her and to ask for her grace and her blessings. In Sanskrit riti means “to return to the source”. By means of ritual, therefore, we will acquire the capacity of returning to our divine origin, of rediscovering the Divine within ourselves. Swamiji generally encourages spiritual aspirants to perform or attend a pooja regularly, if they like, because during ritual the mind and body are fully absorbed in the worship of the Divine. It is a means of learning to control the mind and it also purifies the mind. At the same time, we absorb much spiritual energy and enjoy the physical and mental connection to the sacred divine. In the following satsang, Swamiji talks about how to pray to the Divine Mother, especially during this auspicious festival period. He wholeheartedly encouraged the ladies in the Ashram not only to take an active part in the running of the Ashram but also to perform the daily worship. 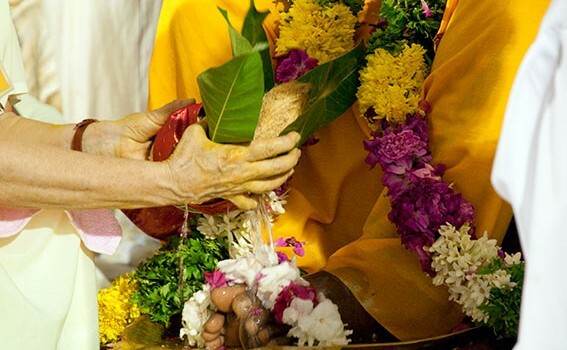 This has continued since Swamiji’s samadhi and ladies are performing the temple worship to Swamiji’s samadhi lingam and performing abhishekam to the puja hall deities on a daily basis.